What is traditionally served for lunch among the Portuguese? Who was my guide at Angkor Wat? 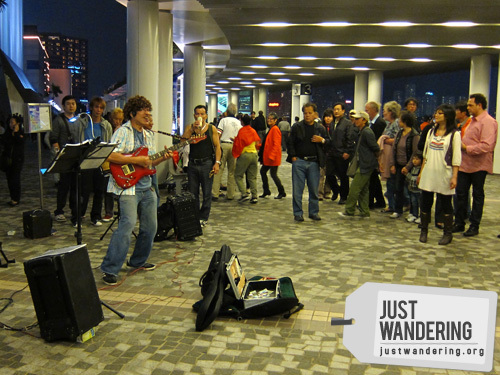 What song is this busker singing? If you answer all five questions correctly, you automatically qualify the raffle. You can up your chances (or make up for wrong answers) by answering the bonus questions, which were given out through Twitter, Facebook and the RSS feed. Answers must be submitted through this form. Contest mechanics, terms and condition can be found in this post. What do you get for all that effort? A chance to win this basket of goodies (basket not included):. Names with an asterisk (*) means that you got one answer wrong, but you answered the bonus questions correctly, thus offsetting the wrong answer. You need to get ALL answers correctly if you want to get 3 raffle entries. Names with a hash (#) means that you got 9 out of 10 questions correctly! Names with two asterisks (**) means that though you scored at least 6 and above, I’m giving you only 1 raffle entry each since I have strong reasons to suspect you are just one (or 2) persons using different combinations of your name and e-mail address in an attempt to get more entries in. cant find the answer to two of the bonus questions. waah. Hi Nina, how many questions have you already given out as of today? thanks! makes me want that loot basket more. My friend is doing her own backpacking in Thailand, Cambodia and the neighbouring SEA countries starting this February. For a month! =D I want to give her some of the loots if I win. Yay!